In Matthew 11:28-30, Jesus said, “Come to me, all who labor and are heavy laden, and I will give you rest. Take my yoke upon you, and learn from me, for I am gentle and lowly in heart, and you will find rest for your souls. For my yoke is easy, and my burden is light.” He longs for us to bring our greatest troubles and lay them on his shoulders. But Jesus also said some difficult things—some things that make us wonder how his yoke is easy and his burden is light. For example, Jesus talked about our relationship with money quite often, always in radical terms. Eleven of his thirty-nine parables are about our handling of money. Tim Keller says that at least 28% of the time Jesus opened his mouth, he spoke about money. His words land on us differently. For some, we feel conviction. We know we don’t steward our money well, and we may even feel condemnation. Others of us harden our heart. We love our money more than we think, and when someone speaks to it, we find resistance. Jesus knows this. But Jesus is never afraid to afflict the comfortable and comfort the afflicted, and he can’t do either if he never speaks to us the hard things in shocking ways. But here’s the wonderful truth about the hard things Jesus says. When we listen and accept his teaching, we find the freedom we’ve longed for, and the joy we never knew was possible. This kind of faith if risky. But in following Jesus, we leave what we’ve known to follow the man who died for us. If he did that, surely, he knows best. So how do you relate to money? Is it merely a means to an end, or is it an end in itself? Do you guard it closely or spend it liberally? What does your money say about what you believe about security, about comfort, about God? The 20th-century Presbyterian leader, J. Gresham Machen said Christians can do three things when encountered with the culture around them, which includes our handling of money. Machen said we could run from the culture, give in to the culture, or consecrate the culture, bringing it under Christ’s redemption. This helps us understand the overarching point Jesus is making. What are we to do with our money? We are to use it wisely. Let’s not run from it, trusting in a theology of poverty to gain righteousness. Let’s not give in to it, trusting in a theology of prosperity as proof of God’s love. Let’s consecrate it to the Lord and use it wisely, making friends for ourselves. So how do we do that? Surprisingly, Jesus uses a story of a manager doing under-the-table deals. In doing so, he makes friends for himself as he nears a time when he’ll really need them. He’s using money as more than a currency for material goods. He’s using it as relational currency. Jesus then tells his disciples to be like that: to use money to make friends for themselves. That sounds problematic, doesn’t it? It sounds manipulative, as if he’s telling us to become liars and cheats. But surely Jesus isn’t telling us to do something wrong. No, he’s not. But this parable is one of the most difficult parables to interpret. So let’s walk through it now. There is a rich man who employed a manager. This manager controlled all the rich man’s affairs. He spent his money, invested his money, managed his land and assets. Over time, the rich man got word (presumably from his friends in the community) that the manager wasn’t doing his job well. He was wasting his master’s possessions. Jesus uses the same word for waste as he used in the parable of the prodigal son for what the younger son did with his money. He mismanaged it. So the boss called him to account. The story was filled with tension. The manager said nothing in response, and as the master asked him to turn in the books, he fired him. The manager’s silence was a guilty plea. He made no defense. But he still had the books in his possession because he hadn’t brought them with him to the meeting. So, he quickly devised a plan to buy friends for himself before the books are out of his hands. He knew he couldn’t do manual labor, and he didn’t qualify to beg for money, so he needed a plan to find another job in his field. What will he do without a steady income? He looked for someone else who would “bring him into his house,” giving him another job at another estate. The manager wasted no time. He went out and settled debts with people who owed his master. He cut their debt in half, requiring only that they repay instantly. They accepted the terms, happy to climb out from under the weight of their obligation. As manager, he had full authority to do this. They think something must have changed since the terms of the contract changed so drastically, but the manager had the right to do this as he worked on on behalf of the master. This favor of reduced debt was welcome. And one day soon, the manager would need the favor returned. Jesus is not saying what the manager did was good. It was sinful. Instead of repenting and pleading for mercy before his master, he added sin to sin. He changed the terms of the contracts. He lost money for his master to gain friends for himself. And his plan worked. You can imagine the joy in the community as debts were reduced and settled one by one. What can the master to do at this point? When he saw the books and what the manager did, he had two options. Kenneth E. Bailey explains them. First, legally he can go to the village and explain that the reductions were not authorized, the steward had been fired at the time he made them, indeed he had no legal right to do anything, and the original amounts must be paid in full. But such an action would turn the party in progress that was praising his generosity into a gripe session attacking him as unreasonable and unfair. Or, second, the master can remain quiet, pay the price of this clever rascal’s salvation and continue to enjoy his reputation as a generous man, which is enhanced by this ruse but not created by it. He is a generous man because he dismissed the steward but did not jail him. Furthermore, he could have sold the steward and his family as slaves to recoup his losses, yet he did not. His generous nature led him to refrain from both actions. Though the manager didn’t repent before him, he trusted the mercy of his master to not imprison him, sell him, or kill him. And in the end, the master was impressed with his shrewdness. He didn’t only make friends for himself, he made friends for the master too. He rewound the bad feelings of crushing debt and played a new song of relief. For actions that should have led to more trouble for the manager, he’s instead commended. T.W. Manson says of the master’s attitude, “There is all the difference in the world between ‘I applaud the dishonest steward because he acted cleverly’ and ‘I applaud the clever steward because he acted dishonestly’…we must take the purport of the speech to be: ‘This is a fraud; but it is a most ingenious fraud. The steward is a rascal; but he is a wonderfully clever rascal.’” Tom outsmarted Jerry once again. Robin Hood stole from the rich to make friends with the peasants. The risk yielded a reward, and the master paid the price. What? How is what the manager does a model to God’s children? He thinks his life through. He’s reached the point of realization that unrighteous wealth has let him down. He sees there are more important things, more urgent things. So he gets to work wielding the sword of money for a different purpose: to make friends. Money never lasts. Its entire purpose is to be used up. But friends can last forever. They keep giving even when the bank account is dry. 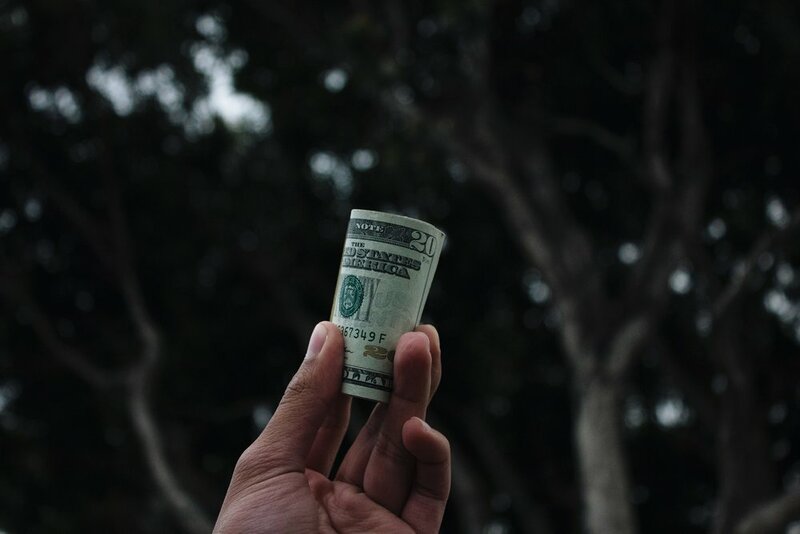 If secular people understand that wealth can be used in a variety of ways, one of which is to gain influence and friendships among others, Christians need to be even more aware of money’s usefulness. Money is a terrible master, but in the hands of the Master, it can be of great worth. Ray Ortlund opens up the heart of this parable in his sermon on the passage. When we think about it, it does make sense. Don’t you want to live now in such a way that, at your funeral, people will weep? Of course you do. Well, extend your thinking one step further, beyond the grave. When you walk into heaven, fully qualified by the righteousness of Christ alone, wouldn’t it be wonderful to be greeted by friends and rejoiced over and thanked? Here in verse 9, Jesus is talking about heaven in a very concrete way – “… they may receive you into eternal dwellings.” Do not think of heaven in a mystical way. Eternity in heaven is very connected with this life on earth. People you know, people you influence for Jesus in this life, will recognize you. They will welcome you. They will say to you, “Thank you for caring about me, opening your home to me, providing a church for me. You rearranged your life to move over and make room for me. Thank you for sending that missionary to my part of the world. You made the difference for me and my people. What you did was how God got through to me.” So, how can we live right now such that ripples of impact flow out into people’s lives for eternity? Are we thinking about that? Are we budgeting for that? Isn’t this clear biblical reality enough to start a new revolution of gospel generosity sweeping over our wealthy city today, starting with us? In grace, Jesus has entrusted so much to us. What are we doing with it? The unrighteous are clever. Are we? The unrighteous plan and devise and take risks. Do we? If not, why not? How can the unrighteous be more active in the world than we who have all the Father’s riches at our disposal? The world has schemes; we have scripture. The world has mountains of money; we have Christ’s immeasurable riches. The world has worldly wisdom; we have the wisdom of Jesus. How far is the kingdom advancing in our sphere? Push hard, Jesus says. The unrighteous know how to do this. Do we? When you think about using money, what goes through your mind? Do you think if you had more money you’d give more away? Well, what do you give now? Do you give sacrificially? If not, what will change when more deposits into your account? We all know that ministry is costly, and that cost is provided through sacrificial giving of God’s people. It demands our time and our comfort. We open our homes and confess our sins and rearrange our schedules. But too often, we keep our wallets shut. We are like the dishonest manager, wasting the master’s money. We must see that we are stewards of money that isn’t ours. What if we were like the manager, being called to account, how would our spending habits change? Why not do that now? God is not surprised that ministry is costly. He has placed us in this world that operates inside economies with stock markets and housing bubbles and material needs. Jesus’s disciples lived in the world as well, and when he looks at how they use their money he sees a problem. They have the right eternal perspective when it comes to salvation, but their eternal perspective isn’t showing through on their use of temporary resources like money. They’re living in light of heaven but missing an opportunity to bring earth up to heaven. God has given them the most valuable resource in the world (himself) and in response, they’re using the temporal resources ineffectively. They need to learn to be smart, to be shrewd, to be wise in the ways of the world. Jesus is telling us not to be financial morons. Let’s not remove ourselves from the world and let’s not pour our heart into the world. Let’s consecrate the world to God. Let’s use what he’s given as he would want us to use it, because we are all stewards of money that is not ours. We are all the manager in this parable. We have all mismanaged the master’s possessions, and he is calling us all to account. Are we even thinking through what to do next? Or are we so out of touch that we don’t even care? How can God ever give us more if we are unwilling to do as much as we can with little? Francis Schaeffer understood how to use what little God gave him. His ministry started with just his family moving into a small chalet in Switzerland. It grew from there into a worldwide ministry impacting thousands of lives. But it was costly. In one place, he wrote about the cost of running his ministry. It’s a costly business to have a sense of community. L’Abri cannot be explained merely by the clear doctrine that is preached; it cannot be explained by the fact that God has been giving intellectual answers to intellectual questions. I think those two things are important, but L’Abri cannot be explained if you remove the third. And that is, there has been some community here. And it has been costly. In about the first three years of L’Abri all our wedding presents were wiped out. Our sheets were torn. Holes were burned in our rugs. Indeed once a whole curtain almost burned up from somebody smoking in our living room. All races came to our dinner table. Everybody came to our table. It couldn’t happen any other way. Drugs came to our place. People vomited in our rooms…. If you have been married for years and years and had a home or even a room and none of this has ever occurred, if you have been quiet especially as our culture is crumbling around us, if this is so – do you really believe that people are going to hell? We fight the liberals when they say there is no hell. But do we really believe people are going to hell? Who will say that about you? What friends are you making? What’s our path forward? It’s not easy to discern, is it? This parable is about as clear as a muddy window. But Jesus doesn’t leave us with a question mark for too long. He provides the answer in himself. What does it mean to make friends for yourself? Look to Jesus. How did he do it? Jesus said, “I tell you, make friends for yourselves by means of unrighteous wealth, so that when it fails they may receive you into the eternal dwellings.” Jesus doesn’t say money might fail us. He says it will fail us. Everything in this world ultimately does. Everything breaks. Everything dies. Everything rebels against us. So if we put our hope in things here below, we will be disappointed. It’s a matter of when, not if. So when it fails us, we can look to the one who made friends of unrighteous wealth. What did Jesus do? He took up the unrighteous wealth of flesh. He entered the dumpy town of Bethlehem. He rested his head on a common rock, one he created centuries before. He let dust get on his feet. He washed the dirty feet of his apostles. He walked the bloody road to Calvary. He died upon the cross. He used all the unrighteous things the world gave him to make us his friends. “For you know the grace of our Lord Jesus Christ, that though he was rich, yet for your sake he became poor, so that you by his poverty might become rich.” (2 Corinthians 8:9). Jesus Christ knew how to use what God gave him. He emptied all he had to turn his enemies into his friends. He was the ultimate steward of God’s riches, and he poured them all out on us in his life, death, and resurrection. He not only reduced our debt by half, he paid it in full. He paid the highest cost himself, so that out the reward for his suffering, he could call us to lay our burdens upon him and find rest. Our response to that saving love cannot be to huddle up and retreat from the world. It cannot be to rush head-first into the world’s ways. It must be, for the sake of Christ, to consecrate it all to God. We must use what we have been given for the advancement of his kingdom. We must make friends for ourselves, because in doing it in the power of the Spirit, God uses us to make friends for himself. And one day, we will enter eternity and find others there who will welcome us because we welcomed them. They will welcome us into the eternal dwellings. And who knows, they might be there with us as we meet Jesus face to face for the first time. What dollar do you have that isn’t worth that?